A highlight of my summer is getting fresh basil from my parents’ garden. They grow this stuff by the cubic ton. 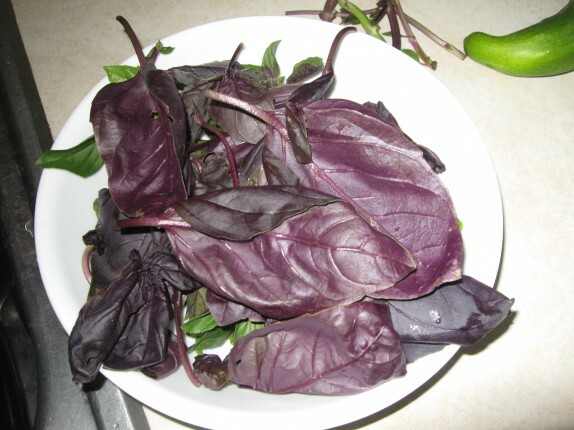 This year, for Fathers Day, I gave my dad a few plants of Thai basil, which has a faint anise flavor, and purple basil, which tastes like regular green basil. Apparently, they grew like crazy, and he brought me a humongous bucket of those two and regular green basil. I wanted to see what it would be like to make pesto mixing the three. 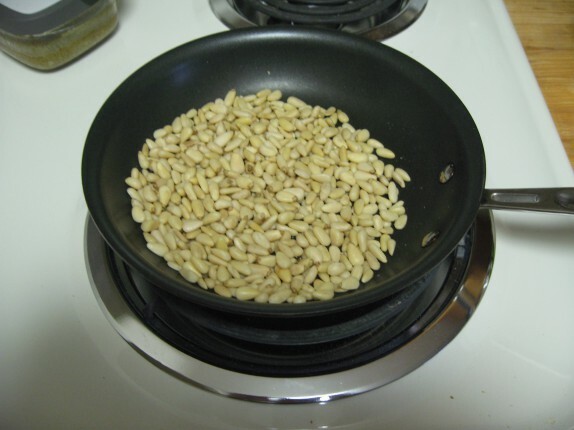 I started by lightly toasting some pine nuts. I added some fresh garlic and some olive oil to a blender. 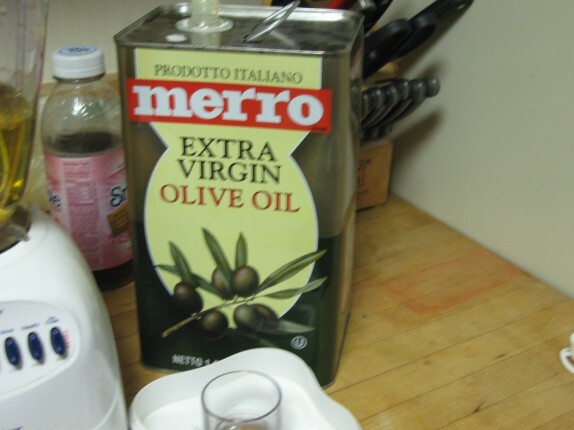 My olive oil of choice this time was Merro Extra Virgin (always extra virgin). I had a huge amount of basil, the three varieties described above. I blended the hell out of the basil, adding a few leaves at a time to the oil. 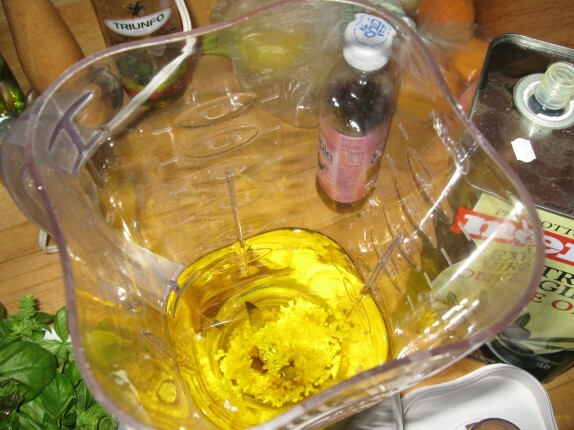 When it got too thick, I added a little more oil. Throughout the addition of basil, I adjusted the salt and pepper levels. I was mindful of the consistency of mixture and of the salt content because I still had to add grated cheese, which would thicken it and make it saltier. 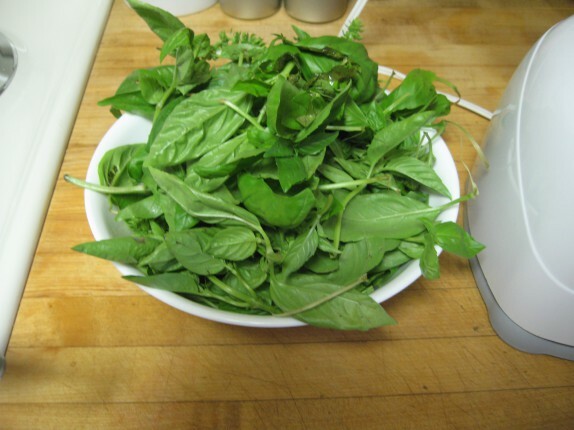 Once all of the basil was incorporated, and I had a fairly loose mixture. I added grated cheese, a mixture of Parmigianno and Pecorino, but not by blending; I incorporated the cheeses using a spoon for reasons that should be blatantly obvious. Why do I mix cheeses? Parmigianno is a great cheese, but it’s fairly mild and doesn’t stand up against the strong basil and olive oil on its own. By adding pecorino, which is a more pungent cheese, you get a bit more sharpness, which is what I like, remember, this is being made to my tastes, which is also why there are no proportions throughout this recipe. I don’t think there was enough Thai basil in there to affect the overall flavor of the pesto. Remember, it’s a whole lot of basil up against garlic, pine nuts, cheese, and olive oil, all of which are pretty strong flavors. The handful of Thai basil leaves, which taste slightly different from standard basil, isn’t gonna shift the flavor that much. The overall color of the pesto was darker than my usual pesto batches; this is totally expected. 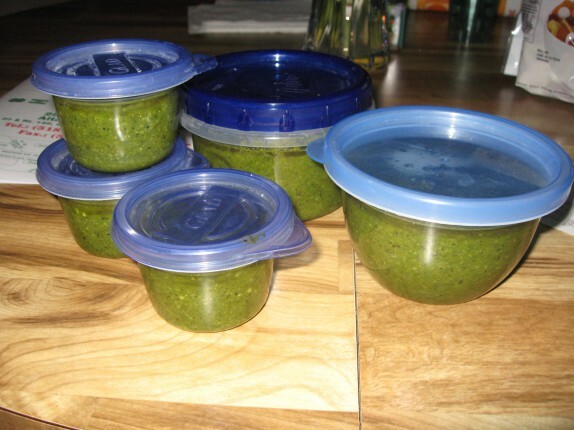 When all was said and done, I put the pesto in some of my finest plastic containers. My purple and green came back as a combined dark green this year. Very yummy and made a nice Pesto. I freeze mine in ice cube trays for eazy storage. Where did you buy the pine nuts?